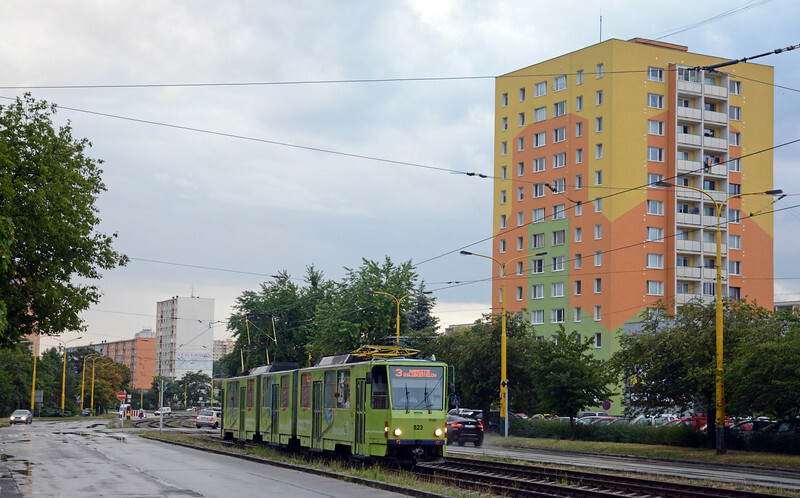 A four day long weekend based in Košice, Slovakia's second city, and taking in the 5' gauge iron ore railway from Ukraine, the non electrified Košice to Zvolen line via Rožňava, the mainline to Bratislava through Margecany and the trams on the present, truncated, system in Košice. Košice is easily reached thanks to Hungarian budget airline W!ZZ, who fly there from Luton and/or Sheffield/Doncaster once or twice a day. I stayed downtown in the Doubletree by Hilton, the former Hotel Slovan. Košice has plenty going for it as a short break destination - the city itself has a well preserved centre that avoided destruction in WW2, in the summer it is an outdoor city, with bars and restaurants al fresco on the pedestrianised main street, Hlavna. The Slovenské rudohorie Mountains are to the west and north of the city, good for walking, mountain biking and, in the winter, skiing. The river Hornad has been dammed in a number of places creating a series of lakes which attract all sorts of summer activities too. And through all this scenery run the varied trains of ZSSK, ZSSK-Cargo, Regio jet and others.